has reached to the capacity. You can run over the bridge and it is felt like you are running on the ocean!! When runners are on the bridge, you can feel as if ocean surrounds you, and also you can see Tokyo Skytree or skyscraper of Yokohama and Tokyo. If you are lucky, you also can see Mt. Fuji!! Of course, you can experience Japanese hospitality such as local speciality and cheering while you are running! Entry from this site is Chiba Aqualine Marathon 2018. This site accepts individual entry for International Division ONLY. Men or Women who was born before April 1st, 2000, and can complete the race within 6 hours. *In case the Executive Committee decides that the bridge section of the Aqualine cannot be used due to strong wind, etc., shortened race using only ordinary roads will be implemented. 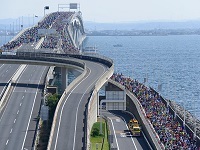 *For all events, in case the Executive Committee decides that the bridge section of Aqualine cannot be used due to strong wind, etc., shortened races using only ordinary roads will be implemented so that the Marathon event will be changed to a Three-quarter Marathon (31.646 km), and Half Marathon will be changed to　Challenge Run (10.2 km). (1) For those who were born before April 1, 2000, able to finish marathon in 6 hours orhalf marathon in 3 hours and 10 minutes. (2) Participants who cannot viably run alone may be accompanied by one co-runner (accompanying person). However, the participant is responsible for the arrangement of the co-runner. Guide dogs are not allowed. Charity programs will be implemented for social contribution. Choose a charity preference when applying. A 500-JPY charity fee will be charged separately from the participation fee. Those who donate 100,000 JPY will be able to participate free of charge (including an optional special charity frame at the time of application). ・ Donators will be given an “Original Race Silicon Band” along with a number card. ・ Runners who register as a pair or a group and wish to donate, will be considered to participate as a whole. of the donation to the above recipients. ・ Please apply after agreeing to the above conditions. 1. Top 8 finishers overall (male and female respectively) will be awarded. 2. Top male and female runners for each age will be awarded. 3. Top 3 groups will be awarded. 1. Top 3 finishers overall (male and female respectively) will be awarded. natural disaster, or other cause. The organizer will set checkpoint closures and security measures during the event. The race will be stopped if checkpoint closures are delayed significantly. Checkpoint locations may be changed. The following first-aid stations will be available to provide medical assistance in case of injuries or accidents. 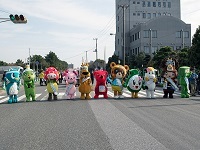 ・ There are AED mobile team, basic life support team, and doctor runners on the course. ・ Locations of first-aid stations may be changed. Participants should manage their health at their own responsibility, and it is recommended to take a medical examination beforehand. ・ The organizer is not responsible for any injuries or accidents during the race, except for emergency measures. prior to the race. In particular, please pay attention on the upward slope after passing 33-km distance. Please check “Course Slope Map” located below the Course Map. From April 13 (Fri.) to May 8, 2018 (Tue) 5 pm. You can apply for your friends if you add your friend or family at the list at "My page"in JTB Sports Station site. ・Group representative should obtain approval from all group members. ・ Group representative should confirm registration information of all group members before applying. 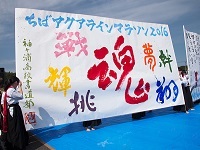 ・ All group members must apply for the same event. A small number of runners who finish this race may be dispatched to overseas marathon races (Taipei Marathon, Kaohsiung International Marathon). ・ Please confirm your Entry Status located at "My Page" after you applied for. *Reception will only be accepted for overseas participants. information, and to provide services from our sponsors, collaborators, and affiliated organizations. etc. belong to the organizer. [Please read thoroughly]By applying, participants agree to the following terms. (1) Entry fee will not be returned if the registration is cancelled by the applicant. (2) Participation will be cancelled in case of falsified information on age, gender, record, etc., or if another person runs in place of the applicant. (3) Entry fee will not be refunded if the race was cancelled due to natural disaster such as earthquake,storm, flood, snow, accidents, contagious disease, or other incidents beyond the control of the event　organizer. (4) No refund will be made for overpayment and/or duplicated payments. (5) The organizer shall comply with laws and regulations for the protection of personal information and carefully handle participants’ personal information. (6) Please be aware that duplicated application to the marathon and half marathon by the same person and duplicated application in individual entry will be disqualified. (7) No entries or changes to existing entries can be performed after the entry period. Participants may be contacted or e-mailed if there are any problems with the application. (8) Please be advised that the organizer is unable to respond on questions about entry status by phone. Please be advised that we will not reconfirm about the non-arrival of emails to the registered email address due to incomplete address. be disqualified. Regardless of reason, no compensation or refunds will be given. (10) The organizer is not responsible for any delay in the application due to a malfunction of the internet line. (11) Applications may not be accepted depending on the device, operating system, or browser software　used by the applicant. (1) No refunds will be made for any cancellations due to reasons not attributable to the organizer's responsibility. (2) The organizer will set up a luggage service. Luggage from half-marathon participants will be transported to the finish venue and returned to the participants afterwards. (3) The organizer is not responsible for participant’s late arrival due to public transportation, road conditions,etc. (4) Runners cannot display or wear any design, trademark, etc., that display company name, product name etc., for advertisement purposes at the race venue (including inside the course). (5) The organizer may consign sales of photos etc. for organizations approved by the organizer. (6) Runners cannot participate if wearing a costume that will endanger their health or considered so by the organizer. (7) The organizer will not issue receipts for entry fee, etc. Transfer slip shall be the substitute for receipt. (9) In addition to the above, please follow the instructions of the organizer for any matters concerning the race.